More than 500 de Zavala students, staff and parents attended the school’s second annual Hispanic Heritage Month Celebration on September 28. 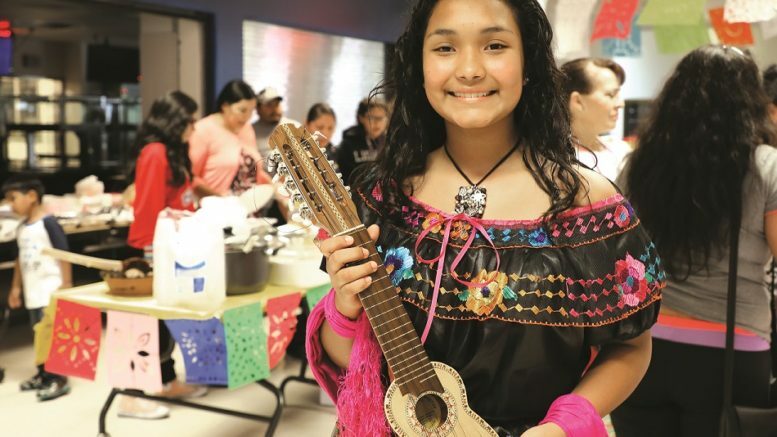 Parent volunteers, AVID students and staff worked collaboratively to orchestrate an event that brought the community together in a showcase of student creativity, song, folklórico dance and traditional Hispanic food. The hallways were lined with AVID and AP Spanish students presenting on the influence of their culture in their lives or on Latino historical figures. In the cafeteria, guests were treated to a collaborative performance between the band, orchestra and choir, and the Nimitz folklórico team also performed. The evening concluded with a potluck dinner of authentic Hispanic food, provided by parents.